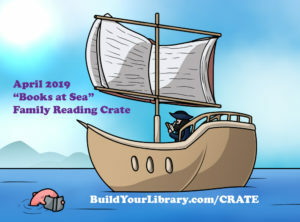 Welcome to the 17th installment of the Build Your Library Family Reading Crate! How many have you collected? 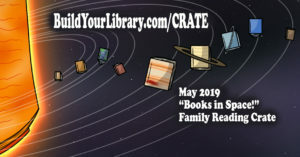 The May 2019 theme is “Books in Space!” In contrast to our February 2019 non-space related sci-fi crate, this crate is all about outer space. I’m including at four books in our galactic adventures themed box – a picture book for younger children, a middle grade family read aloud, a book for older readers, and a book for you, the parent! These books are handpicked by me so that you are all reading quality literature. Every box will include a booklet with discussion questions and rabbit trail ideas, as well as a link to a page on our site with additional links, booklists, movies and documentaries, and printable activities to go along with the books. You’ll also always receive a few exclusive crate bookmarks, and at least one or two additional items that go along with the monthly theme. It’s like getting an all-inclusive family-wide unit study in a subscription-style book box each month! See the full BYL Family Reading Crate (FAQ) here. Second chance at a missed crate. All remaining 2018 crates are now on sale for $25.00. See above for the current month. [Alaska Crate, Jan 2018] I am so excited for this. My family has been watching a lot of those shows about people living in Alaska lately so this will tie in perfectly. [Alaska Crate, Jan 2018] Hi Emily, we just got our crate today and I was thrilled that you included a mini curriculum booklet. I am so excited to read these books to my girls. Thank you for putting such a thoughtful collection together. You’ve done it once again! These crates are just fantastic for our homeschool! Thank you for all you do. We are loving our May crate. We are taking our time and enjoying the family books so much. I read the parent book “Lily and The Octopus” much too fast but was hanging on very word. Probably never would have heard of let alone read these books without this cool crate! !